New York is home to ample waterways, including the Atlantic Ocean, the Long Island Sound, the Hudson River, Jamaica Bay, and countless other rivers, and lakes. While having access to the water is certainly one of the biggest perks of living in New York State, there are also certain drawbacks; the biggest of which is flooding. Heavy rains, high winds, and storm surges can cause severe flooding that can result in catastrophic and costly damage. In 2012, Superstorm Sandy, the largest and costliest hurricane of the 2012 Atlantic Hurricane Season, an estimated $32 billion in property damages were reported. A large portion of these damages were attributed to cars. But it doesn’t have to take a storm of unprecedented magnitude to cause such catastrophic damage. A sudden downpour can result in flash flooding that can end up causing extensive damages. If you live in the State of New York, especially if you are situated in areas that are deemed flood zones, it is in your best interest to protect yourself – and your vehicle – from the damages that floodwaters can cause. What Type of Auto Insurance Covers Flood Damage? 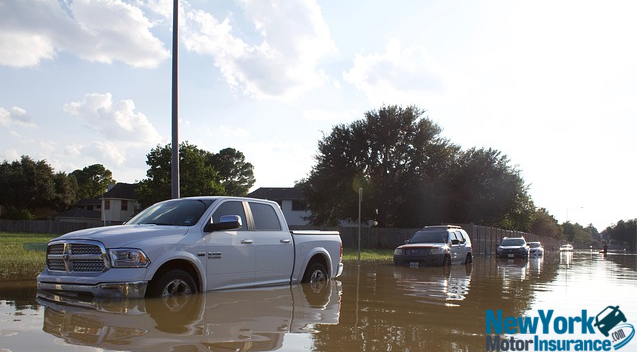 If your vehicle is damaged by floodwaters, you will need to have comprehensive auto insurance in order to cover the cost of the repairs. In New York State, comprehensive coverage is not mandatory; however, given the risk of flooding throughout the state, it is a wise investment. This is particularly true if you live in an area that is prone to flood or near an area that is prone to flooding, if your car is less than 10 years old, and if it is worth more than $3,000. Comprehensive auto insurance covers damages that are considered “acts of God”, or anything that is unpredictable or that cannot be controlled. Since a flood can occur without warning or its extent cannot be controlled, it is deemed an “act of God”; therefore a comprehensive auto insurance policy will pay for the damages to your vehicle as a result of floodwaters. What Will Comprehensive Auto Insurance Cover? In regard to floods, comprehensive auto insurance will cover any damages that are the result of your car being subjected to floodwaters. For example, seawater causes your car to corrode, or if your engine, braking, and other vital electrical systems are flooded out in a flood, your comprehensive car insurance policy will cover the cost of the damages. Also, whether or not the insurance company will pay to repair your car depends on the value of your car and the extent of the damages. For example, if the actual value of your car is only $3,000 and the flood damage is an estimated $8,000, your car insurance company probably won’t pay for the damages; instead, they will write you a check for the actual value of your vehicle; in this case, $3,000. You can purchase comprehensive insurance for your vehicle from any New York car insurance agency. However, before you purchase this type of added protection, you will first need to show proof of liability coverage. In New York State, liability coverage is the minimum auto insurance requirement; therefore, you are not permitted to purchase additional coverage options unless you have liability coverage. Many motorists choose to purchase their comprehensive coverage from the same insurance company that issues their liability policy. It saves a lot of hassle, and it can also save money. Many insurance providers offer discounts when they write additional policies. There is no telling when a flood will strike in New York State. While yes, there are particular times of the year when floods are more likely to occur, they can happen at any time. With that said, it is in your best interest to purchase a comprehensive auto insurance policy as soon as possible. For example, you should consider investing in one when you purchase your liability insurance. Doing so will safeguard you from the potential risks of flooding. By carrying comprehensive auto insurance in New York State, you can safeguard yourself from the perils that are associated with floodwaters. Flood damage can cause an exorbitant amount of money. If you want to avoid having to foot the bill for the damages yourself, you should consider investing in comprehensive car insurance. While this type of coverage will cost more, in the event of a flood, the additional cost will be worth your while.